Products tagged with 2nd a.c.r. Home / Tags / 2nd a.c.r. Embroidered 2nd Armored Cavalry Regiment Patch with Emblem and "Combat Veteran". Iron on or sew on. 6" wide x 3" high. 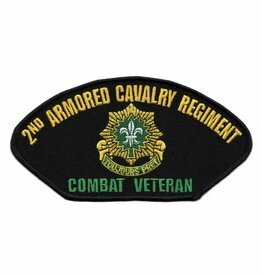 Embroidered 2nd Armored Cavalry Regiment Patch with Emblem and "Combat Veteran"